Whenever you need car shipping from and to Montana, AA Car Transport is the best option for you. We have years of experience in this field, being among the top car transportation companies in the US. We offer high-quality, professional services such as open car carrier, enclosed car carrier, soft side trailer, drive away, terminal to terminal, door to door and much more. We always make deliveries on time and safely. Montana is a state located in the western region of the US and it is also known as Big Sky Country, The Treasure State or the Land of Shining Mountains. Montana is among the top 5 states of largest acreage, and this is one of the reasons why it has so much tourism. Tourists travel from around the world to see the beautiful mountains of Montana or the Yellow Stone National Park. If you intend to ship a car to or from Montana, we are ready to offer our services. The University of Montana, located in Missoula, was the first university to be built in Montana in 1893. The campus has six colleges, among which the first and only law school in Montana. In 2015, the university had 12.922 students enrolled. When the summer comes, we can help students ship their cars back home in Montana or other states or in the autumn when they move away from home to the college. Although many students would find a good idea to throw their things into the car and hit the road, letting a teenager drive for such a long distance, sometimes across the country, might not be that safe. There is enough stress when your child is going to college so why add some more? Rely on our experienced team of professionals that can transport any model of car, fast and safely. We know the ins and outs of the roadways and transporting cars coast to coast is our forte and what we do best. Many parents avoid asking the help of such companies for fear that it will cost a lot. With AA Car Transport you will see that you not only benefit from exceptional services, but also from amazingly low prices. You will save on gas, travel expenses, food and keep your child safe from the hazards of the long road ahead. Each year, millions of vehicles are being transported by railroad, truck or large ship to dealerships all over the country. New vehicles cannot be driven to the dealerships because consumers them as used cars. So whether the car is imported from another country or manufactured in the US, it has to be transported to have the lowest mileage possible. But used cars are also transported to and from Montana. 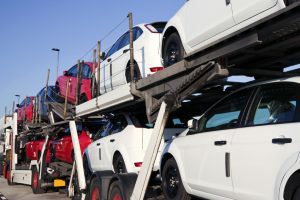 In fact, used cars can make multiple trips on auto tr­ansporters because they are shipped to auctions or wholesale operations before going to a dealer. Car auctioning is a trend which started in 1948 and it quickly became very popular for those who wanted to sell used cars. This method is very useful for remarketers who want to avoid big sales drops in their boards. This system is now controlled by used car dealerships and many countries use this method to get rid of second-hand cars. There are two types of auctions: closed and open. Closed auctions are only for dealers only, while open auctions are for the wide public. At these auctions people can buy repossessed cars, off-lease returns, aging cars from rental companies, trade-ins, cars seized by government agencies, but also new cars from unsold inventory. Many times the auctions you are bidding on is very far from the place you live and once the car is paid for, you will need to have the car transported. Car shipping is a transport service for people who are in the car sales business and for those who just want to move to a new location. Vehicle type and condition – the type of transportation vehicle to be used depends on the type of cargo. Heavy cars need bigger trailers that will cause more gas usage and therefore a higher price, while smaller vehicles will have cheaper fees. If the vehicle is not in a good condition and it needs to be wrenched, special equipment will be needed and a qualified driver to handle this situation. Distance – the average rate is $0.35-$0.85 per mile depend on the vehicle type , plus the broker’s fee. Season – some parts of Montana are very hard to access because the roads are not conducive to large 80ft long car carrier. Also, during the fall and winter months the weather can be prohibitive. Besides that, during some times of the year the auto transport rates increase due to high demand. Make sure you book in advance the transportation option you need in the busy season. By booking in advance you will also benefit from discounts and better price deals. The busy season is in the summer when students and families move out or to Montana and also during October-November when the ‘snowbirds’ move south or north (April-May). Gas prices – for example, a fully loaded 11-car carrier will burn 4 gallons per mile. When gas prices go up, so do the shipping and transport prices. Other taxes – you also have to consider other taxes, tolls, mileage and insurance coverage. Before booking a transportation vehicle, make sure you communicate to the company all the necessary details about the car to be transported. Each detail, no matter how trivial it might seem to you, could be of utmost importance for the company. Make sure you correctly communicate the exact pick-up and delivery locations. This way the company will know exactly where are the narrow streets, curves, dead ends or gates areas that they should avoid or if they can make the pick-up or delivery to that location or choose another. If you need to have the pick-up or delivery services done at a specific date and time, make sure you book at least one week in advance. Also, mention the type of carrier you want: open or closed. The most common are the open ones, but if you have a luxury, sports or classic car and it needs special attention and care, you might want to choose a closed carrier. If you do not mention this when you call to book, your car will be loaded onto an open carrier. In conclusion, no matter if you need to ship a car, a dealer-to-dealer transport or a full load of cars to or from Montana, AA Car Transport is the professional company that you need. We communicate with the customer to make sure that the transportation will take place in the best conditions and with a successful outcome.